The University Student Council (USC) arrived at a consensus Friday to drop all charges filed against Education and Research Committee Head Christian Lemuel “Lem” Magaling and to reinstate him as councilor. “‘Di ko alam kung ikakatuwa ko ang marinig na ido-drop din pala ang lahat ng charges matapos ang mahabang pagpupumilit at paghahanap ng butas. Pinilit kong maging maikli ang trial at wala nang masyadong diskusyon (I don’t know if I should be happy after hearing that all charges filed against me will be dropped after a long process of holding me at fault. I tried to make the trial brief and without much discussion),” said Magaling. The demerit system applies to council members who violate the USC constitution, house rules, attendance guidelines and mass media guidelines. The system was ratified during the USC semester planning last May and was made effective June 6. It was amended during the USC mid-semester assessment on Aug. 9. When a council member acquires three demerits, he earns warning from the Secretariat. Once he/she acquires six demerits, the council member is automatically suspended until a trial for impeachment is arranged. Formal charges must be filed against the officer before he is put in trial. Magaling is not in favor of the demerit system. “Nagkaroon ng pagkakamali ang USC sa paglikha ng ganitong polisiya. Naging hanapan ng butas at pagkakamali ang aming paglilingkod (The USC made a mistake with implementing this kind of policy. Our service became focused on identifying one’s faults),” he said. 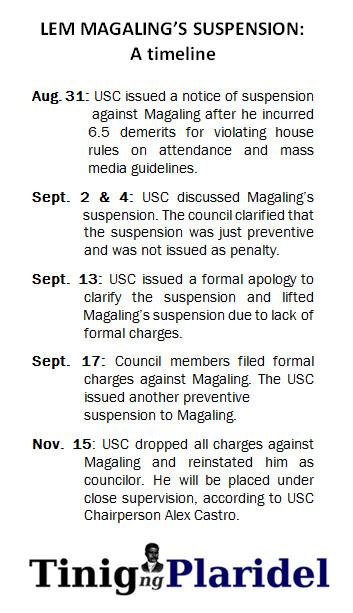 Magaling’s suspension was discussed on the Sept. 2 and Sept. 4 USC general assemblies, lasting up to the wee hours of morning. The USC issued a formal apology on Sept. 13 and clarified that only a preventive suspension was filed against Magaling. The council also lifted his suspension due to lack of formal charges. When formal charges against Magaling were filed on Sept. 17, the Council issued him another preventive suspension. USC Representatives Francesca Louise Angeles from the National College of Public Administration and Governance and Anna Alexandrea Nacional from the College of Home Economics filed a complaint of grave neglect of responsibility against Magaling, their committee head, for his alleged irresponsibility in handling last semester’s Alternative Classroom Learning Experience (ACLE). Both were members of the Education and Research Committee, in-charge of handling the university-wide ACLE. USC Secretary-General Rafael Fernando also filed a complaint on the basis of Magaling’s alleged violation of the council’s rules of attendancemafter Magaling incurred four unexcused absences and one tardiness. Councilor Carla Gonzales, head of the Mass Media Awareness Committee, also filed complaints against Magaling and other USC councilors Neefa Macapado, Erra Zabat and Charlotte France for using the council logo in a video of a political party without the USC’s consent. Fernando and Gonzales were absent in Friday’s trial. When asked for the cause of the delay of the final verdict on Magaling’s case, Fernando said the USC had problems in coming up with a quorum during their scheduled general assemblies. “Back in September, when the time came to make decisions regarding the case, there was difficulty in getting the council to a quorum. We wanted to be decisive but at the same time, didn’t want the council to make an important decision without being as complete as possible. Unfortunately, that resulted in the delay,” he said. After Friday’s assembly, the USC again lifted Magaling’s suspension and reinstated him as councilor. “Nawa’y sa mga nanguna sa gawaing ito, makonsensya sana sila. Gayunpaman, nagpapasalamat ako at ‘di nila pinanindigan ang kanilang pagkakamali at na-drop lahat ng charges (I hope those who initiated this issue would mind their conscience. However, I am thankful that they didn’t stick to their mistakes and that all charges were dropped),” Magaling said.